I went to drop my friend off at the still functional Bus Stop at Tampa Bay Center yesterday and saw ( to my great sorrow..seriously ) that they are tearing down Tampa Bay Center...to build...what? I don't know! Maybe a Parking Lot for the stupid Buccaneer Stadium or..who knows? Anyway, I wish they weren't tearing this mall down. I have a lot of fond childhood memories of the mall. 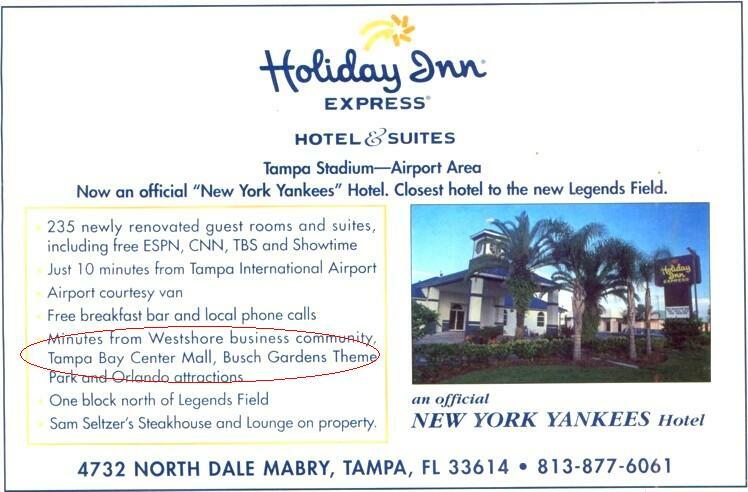 Recently (Last Week), Tampa Bay Center was demolished to make room for a new Buccanears training center. Tampa Bay Center, at the corner of Himes Avenue and Buffalo Avenue (later Dr. Martin Luther King Jr. Blvd.) in Tampa, right across Himes from Tampa Stadium, opened in 1976. It was a 2-story mall with an anchor at each end: Burdines on the east side, Sears on the west side. In the mid-1980s, a third anchor store was built on the south side, a Montgomery Ward, replacing a freestanding store nearby (at Dale Mabry and Interstate 275, where a Wal-Mart now stands). After the expansion, it was 895,000 square feet. There was also a General Cinema movie theater inside the mall near Sears -- with only two screens, if I recall correctly. It closed sometime in the mid-to-late 1980s. The parking lot on the north side had an unusual-for-flat-central-Florida slope to it that meant that the mall entrance on that side of the building was on the second floor, leading directly into the food court. While I was growing up in the 1980s in south Tampa, I preferred going to West Shore Plaza, which not only had a video arcade, but also had a live, talking parrot in the kids' department of the Maas Brothers department store. However, I remember going to Tampa Bay Center more often, especially to Sears. In the late 1980s, as a result of Federated taking over Allied Stores, Maas Brothers' locations were either closed or converted to Burdines stores. 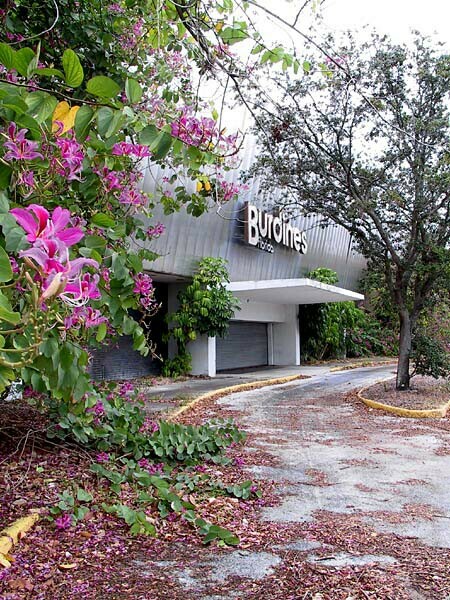 The West Shore Plaza location was one of those converted, and so for much of the 1990s, there were two Burdines stores within a couple of miles of each other. Because Tampa Stadium was slightly off the north-south axis, Tampa Bay Buccaneers play-by-play announcer Gene Deckerhoff used to describe action moving from north to south as going "towards the shopping center," meaning Tampa Bay Center. When I moved out of Tampa in 1997, Tampa Bay Center was still doing well, but within the next few years, the bottom dropped out. Montgomery Ward closed in 1999, and the Burdines followed soon afterwards (actually, Burdines moved to the new Citrus Park Town Center mall northwest of Tampa). Tampa Bay Center hung on with only Sears, but then International Plaza opened nearby in 2001. International Plaza had lured Dillard's away from West Shore Plaza, and in early 2002, Sears moved into the old Dillard's location. Tampa Bay Center closed entirely after that; I'm not sure if there were any smaller stores or restaurants remaining by the end to be kicked out. There was some talk of replacing the mall with a collection of big box stores, but in the end, the Rouse Company sold the mall and the property to a company controlled by Malcolm Glazer, owner of the Tampa Bay Buccaneers. In early 2004, the team announced that new team offices and a practice facility would be built on the site. Tampa Bay Center opened in 1976 as one of Tampa's premier malls. The mall featured Sears, Burdine's, Montgomery Ward, as well as the Bay area's first Food Court. Throughout the 70s and 80s, the mall was a great success. By the 90s, the mall began to show its age. Bigger and newer malls were on the horizon in Tampa and Tampa Bay Center was not prepared. The first blow to the mall came in 1998 when Burdines made plans to close one of the three ancor positions at the east end of the mall. The Rouse Company, managers of the mall, were unsuccessful at attracting another anchow tenant to the aging mall. The next blow came in 1999 when Citrus Park Town Center opened up in Tampa's newer northwest neighborhood, attracting many shoppers. Another blow came in 2000 when Montgomery Ward went out of business, leaving another large vacancy in the mall. Two more blows proved deadly to the mall. In 2001, International Plaza, a much bigger and more modern mall, opened just blocks from Tampa Bay Center. Finally in 2002, the mall's last anchor, moved to West Shore Plaza. Without any anchors and more glamourous malls within close proximity, unsimpathetic shoppers just simply quit returning to Tampa Bay Center and the mall finally died. It proves that Tampa is a big enough city to support several regional malls at the same time. There is hope for the mall's location. It rests in the shadows of Raymond James Stadium, home of the Tampa Bay Buccaneers. Plans are to raze the mall and build a new training facility for the Buccaneers. Tampa Bay Center was THE mall to be in , in the late 80's, although it was located right next to Tampa Stadium, which caused parking & shopping madness during home games of the Tampa Bay Buccaneers. It is situated less than 3 miles from Tampa's oldest enclosed mall, West Shore Plaza. West Shore's owners took a huge gamble in the early 90's by doing a complete remodel and then lured what would be the first Saks Fifth Avenue to the west coast of Florida. Meanwhile 2 brand new malls had opened their doors to shopper in Tampa Bay, Brandon Town Center & Citrus Park Town Center. The "other" major shopping mall, University Square did a quick make-over and has survived, although the attempt to change the name to just plain, University Mall has not been accepted by and large, it is still a square place to shop. So, fickle shoppers has begun to abandon Tampa Bay Center and it's anchors have followed. 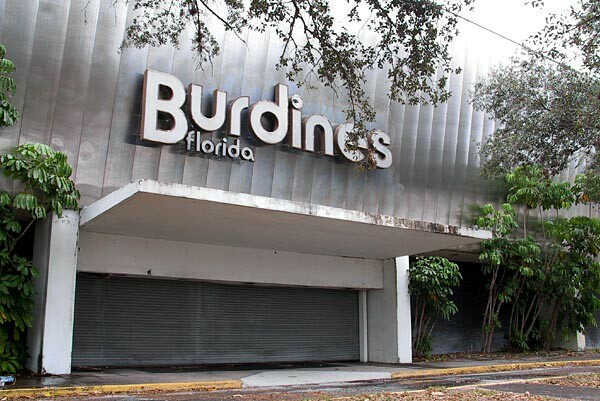 First Burdines closed their doors 4 years ago, followed by the nationwide closing of Montgomery Wards. To date, Sears is the only anchor left along with about half a dozen small stores & only 2 or 3 eateries in the food court. Sears will be moving to West Shore Plaza later this year, to take the place of Dillard's which moved to a new home in the brand spanking new International Plaza, located right between West Shore & Tampa Bay Center, featuring our first Nordstrom's, Neiman Marcus & Lord & Taylor. I think that WestShore will surely struggle although they just completed the final phase of their remodeling, adding 2 upscale restaurants (to attempt to compete with International Plaza's NINE sit down restaurants! ), a complete overhaul of its dated food court and the addition of 2 more parking garages and a 14 screen multiplex cinema. Exclusive Deadmalls.com Photos of Tampa Bay Center submitted by Rich Kummerlowe from Orange Roof.org, a site dedicated to the preservation of the memory of Howard Johnson's. "It refers to the deserted mall as if it were a major attraction." -- Comment from Andrew Morse who submitted this pic.